Since there may be a readership out there – and hello to both of you – let me apologize quickly for not having written anything substantial or substantive recently. I have an excuse of a kind – it’s called finding a job, and one found me. I’m lecturing part-time in History at Pittsburg State University (Yay Gorillas!) – so my leisure activity has consisted of writing numerous PowerPoint presentations on American History since 1865, the History of Kansas and the West, and trying to sleep. There has been a lot of wonderful aviation news and several sad items. The restoration flights and auction of the Mark 1 Spitfires in the summer. 3.7 million pounds, wow. The crash of the Hunter T.7 at Shoreham in the UK earlier in the summer was a particularly low point. The location of a piece of MH370 was sad but may give some of the families a little closure, although I’m fascinated to learn now the heck the wreckage drifted so far. Sadly we seem to know now that MH17 was probably downed by a Buk Surface to Air Missile although the Dutch authorities are wisely not saying who fired it. On a happier note I’m delighted to see in my Facebook feed all the pictures of Research and Development Airframes moving into the new fourth hangar at the National Museum of the United States Air Force. I hope to get back up there again sometime next year, preferably after June 2016 when the fourth hangar opens to the public. In the meantime, a famous aircraft and a famous pilot. I recently commented how much I liked the appearance of the F-104 “Starfighter,” especially in its early USAF liveries. It made me think a little about some other forms that have been inspirational to me over the years. I spent a wonderful few minutes looking at pictures of the English Electric / BAC Lightning, and I promise I’ll put something together in a future post. One aircraft which I find immensely pleasing to look at, and which bears a small resemblance to the F-104, is the T-38. It must the the short stubby low-aspect ratio wings. There’s something about a white painted T-38 that I find very satisfying. I did some image searching and had my breath taken away by this US Air Force image from 1961 – there is a T-38 in there somewhere. 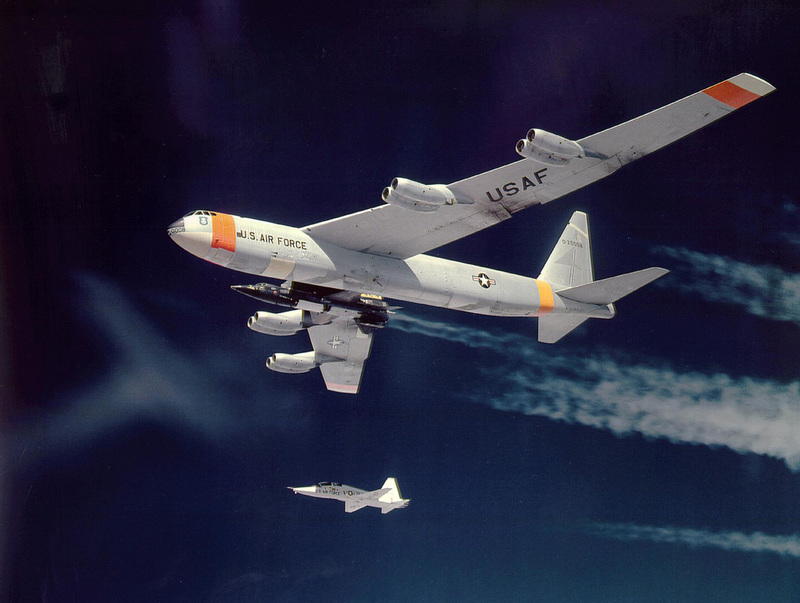 X-15 being carried by its NB-52B mothership (52-0008), with T-38A chase plane. San Diego Air and Space Museum Archives catalog #00043417. The T-38 in this view reminds me incredibly of the Orion Spacecraft in Stanley Kubrick’s 2001: A Space Odyssey – so much so that I can almost hear the strains of “The Blue Danube” as it cruises alongside the venerable NB-52B / X-15 combo. Which led me to yet another ramble. The B-52 has never been a shape I’d call attractive, but it’s symbolized American air power probably more than any aircraft has since the B-17. I was curious why this specific aircraft was an NB-52 but I haven’t found that explanation yet. What I did find was another very pleasing image which completes a little circle for me. A NASA Lockheed TF-104G Starfighter (serial N824NA) flies chase on the NASA Boeing NB-52B during a DAST ARW-1 captive flight on 14 September 1979. “Balls 8 (52-0008) is a NASA Boeing NB-52B mothership, retired in 2004 after almost 50 years of flying service with NASA. 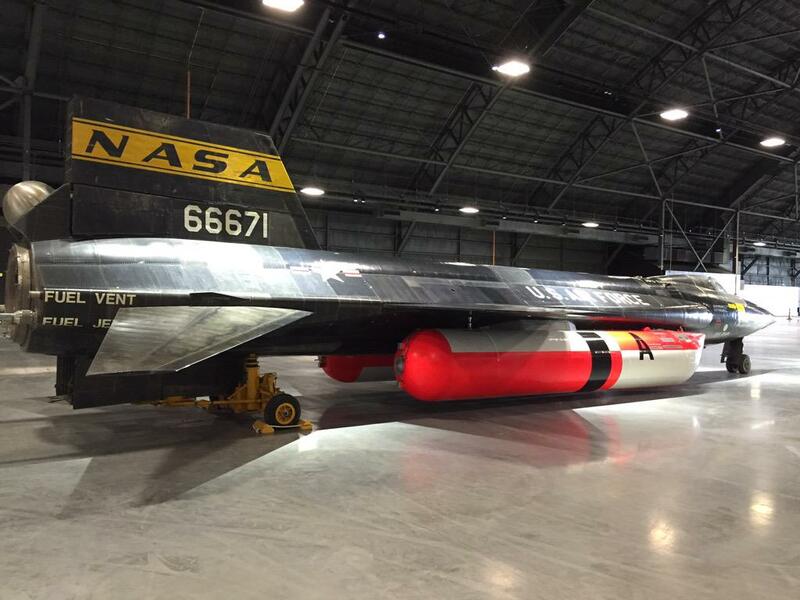 The aircraft is famous for dropping the X-15 aerospace research vehicle on 106 of the 199 X-15 program flights. 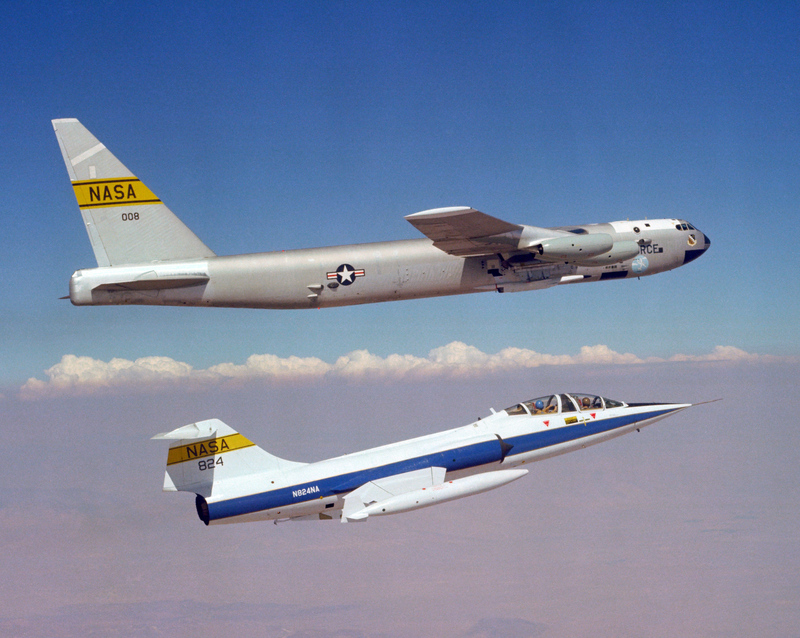 Balls 8 was originally an RB-52B that was first flown on June 11, 1955, and entered service with NASA on June 8, 1959. It was modified at North American Aviation’s Palmdale facility to enable it to carry the X-15.